The best Pilates back exercise may not work the back at all. Instead, when you focus on strengthening the deep abdominal muscles you work to strengthen and stabilize the back at the same time. The beauty of back strength exercises is that every movement in Pilates is focused on strengthening the core or the abdominal wrap, in turn strengthening the back from all angles. I love to use Pilates back exercises for women and men who have low back pain and arthritis because they always feel better after a workout. 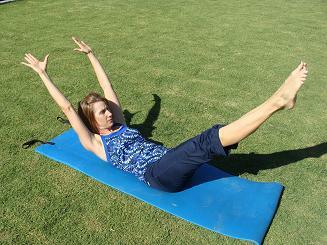 The double leg stretch as shown below is a great way to strengthen the abs and back simultaneously. One of the main reasons people feel better after doing Pilates is that it is a low impact exercise, which means it is gentle on the joints. 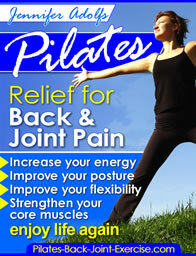 Pilates exercises helps to strengthen and stretch the back at the same time. When you are working the deep abdominal muscles that surround and protect the back they are stretching the muscles of the back at the same time. These muscles may include the spinal erectors that run up and down the spine and the lower lumbar and muscles of the sacrum including the buttocks. Let’s look at some basic Pilates back strength exercises that do both stretching and strengthening of the back at the same time. Bridging is a great back exercise for women and men in that it helps to articulate or open the spine by stretching it as you use the abdominal muscles to peel the hips and spine off the mat. This is one of my favorite exercises to use as a spine warm-up in classes. The students love it as well! They can feel the results quickly as the blood flow through the spine energizes them. In fact, the bridge has taken the pressure off the nerves in the back that can cause neuropathies in the feet and ankles. This exercise can be found in the new Pilates ebook available here. The ebook includes other variations of this great exercise to challenge you further. As far as back exercises for women and men this is one of the best, and one of the most challenging. This Pilates exercise takes lots of back strength and core support to stay balanced and always challenges even the most fittest students in my classes. See more of this Pilates back exercise and other balance exercises here.